New York: Peter Blum Edition. Twenty-eight short texts in Italian and English written between 1977 and 1985, and sixteen reproductions of drawings and prints. The reproductions are printed in varying sizes, and bound between the pages in an irregular sequence. Mario Diacono edited the book and wrote an introduction for it; Peter Blum contributed an epilogue. Translation by Franco Martinelli. 88 pages, 14 black & white reproductions, 4 color reproductions, softbound. 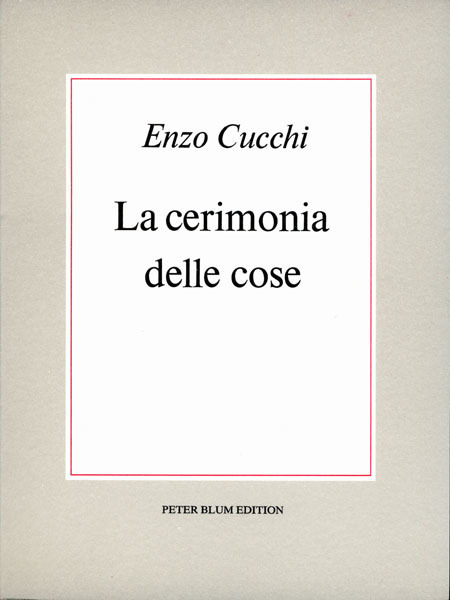 There is an edition signed by Cucchi available. Price upon request.